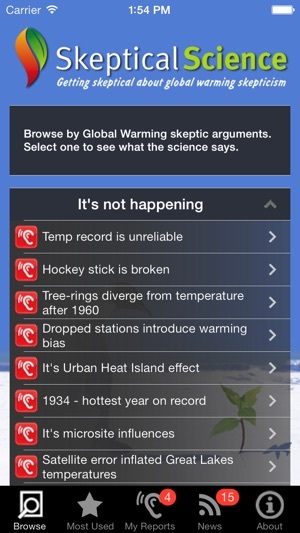 Skeptical Science provides users with information about global warming. To organize its content, Skeptical Science allows users to browse topics, read most-used arguments, submit climate arguments, and peruse climate news with the menu at the bottom of the screen. When users “browse” topics, they are able to read common arguments against global warming and science-based responses to those arguments. The “most-used” arguments provide users with a top-10 list of arguments used to disprove global warming and science-based responses to those arguments. In both the “browse” and “most-used” sections, links to the primary sources for the arguments and responses are included and can be accessed in the app. 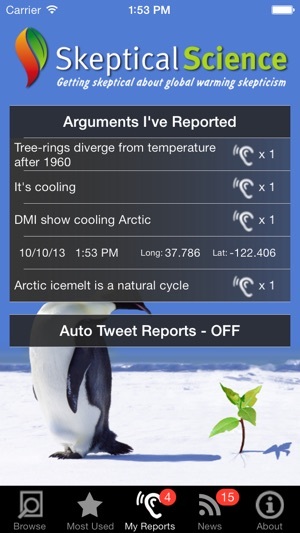 The “my reports” tab allows users to enter arguments that they have encountered against global warming. Please note: Twitter must be synced to Skeptical Science to use this option. 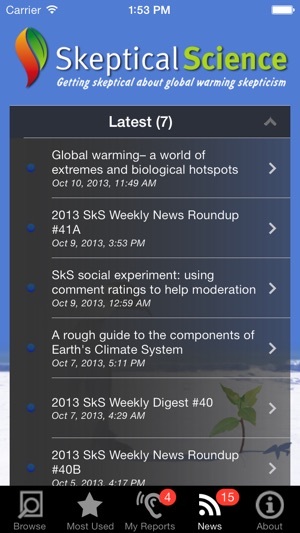 The “news” option provides users with access to top stories about global warming. As part of a global-warming unit, teachers can have students read different arguments against global warming and the science that disproves those arguments. Next, teachers can have students compose an explanation that summarizes why the argument is a fallacy according to science. The summary can be composed using the WPS Office, Hanx Writer, or Pages app. Once composed, students can upload their summaries to a class website or email them to their teacher. Teachers can have students read the “most-used” arguments against global warming or “browse” the arguments against global warming. Next, they can analyze the primary sources for refuting global warming by considering if there are any political, economic, or personal implications for the argument. If implications are found, teachers can have students report their findings by uploading them to a class website. 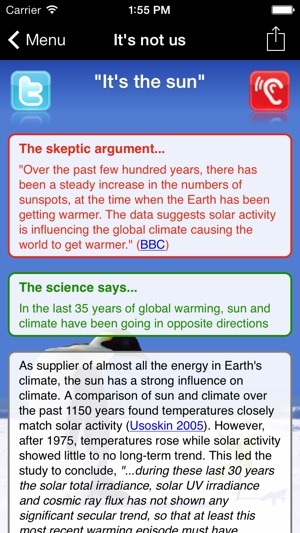 Teachers can use this app to preview an upcoming unit on global warming. To do so, teachers can state a skeptical argument found in this app and then ask students if they think it is true or false. Next, teachers can stir a discussion by asking: (1) Do you think this argument is true or false? Why? (2) What scientific experiment do you think could be done to prove or disprove this argument? (3) Have you ever heard anyone make this argument previously? If so, when and why? 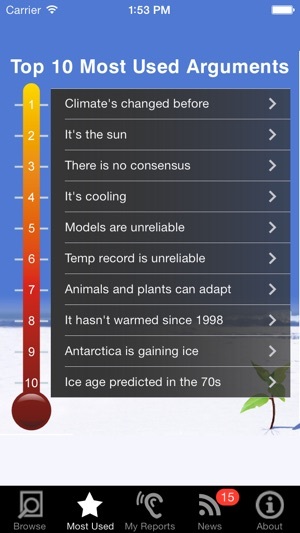 After completing a global-warming unit, teachers can have students “browse” the arguments against global warming and create their own top-10 list. Students can rank the arguments by quality, logic, or popularity, and then compose a rationale for their rankings. They can then share their list and rationale by uploading it to a class website. Once uploaded, classmates can respond to the list and rationale by stating why they support it or oppose it. Poemhunter: Poems from Angeluo, Frost, Neruda and many other poets. Poems about love, family, dream, summer etc.